Piki – Why Can’t I Join In? This book will pull your heartstrings. 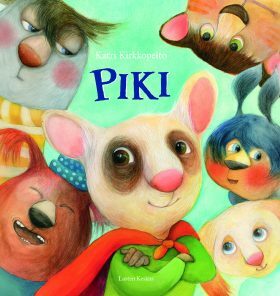 Piki is a story about bullying, recurring in a group, building confidence, emotions and friendship. It was nominated for the Finlandia Junior Prize in 2016 and it has been translated into three languages so far. Piki stands baffled outside the club-house with a superhero cape around his shoulders. His new-found nursery friends are not allowing him to join after all, but instead slam the door in front of his nose. At home the tears fall! Luckily there is Nightbear and above all The Big One, whose warm embrace and calming words comfort the upset little mouse. Together with The Big One, Piki reflects on how to get to play with the others and what a good friend is. Eventually Piki is forced to consider whether everyone is allowed to take part in his play. To act together requires practice.